We put the power of the financing desk at your fingertips with our Online Shopper tool! Want to see how your monthly payment is affected if you increase or decrease your down payment or length of your loan? Want to know what interest rate you qualify for based on your credit score? Want to know how much you’ll get for your trade-in and how that will affect the final price you pay? Online Shopper does all those things and more. Our unique tool allows you to compare monthly payments, down payments, and interest rates in real-time from our lenders. You can experiment with the different options to get to the place you want to be financially for your vehicle purchase. Once you find the deal that best fits your needs, Online Shopper will allow you to save the details so when you come in to purchase your vehicle, we’ll have all of the information on file, which will save you time at the dealership. 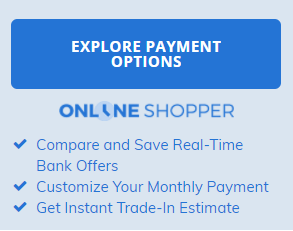 Accessing Online Shopper is easy…simply click the “Explore Payment Options” button which appears on every new and used vehicle posted on our website.